The Japanese Type 96 8×8 wheeled APC (Armoured Personnel Carrier) is produced by Defence Systems Division of Komatsu and entered service with the Japanese Ground Self-Defence Force (JGSDF) in 1995. Due to self-imposed restrictions on exporting indigenously developed and manufactured Military Vehicles, the JGSDF are the only operator. As of 2009, 252 vehicles are in service in three variants. Production is still ongoing in small batches. Main armament 1x Type 96 40mm Automatic grenade launcher or 1x 12.7mm M-2HB machine gun mounted on the commanders cupola. Protection Full NBC system / A laser warning device is mounted forward on the left side of the roof / The hull is of all-welded steel armour construction rated against Machine Gun fire. Engine is located in the front of the vehicle on the left hand side, the Driver to its right, with vehicle commander and his cupola located behind the driver. The rear compartment is utilized for different variant roles. Armoured Personnel Carrier – Rear section can accommodate 8 troops and their equipment. They exit the vehicle via a powered ramp in the rear. The troop compartment has two firing ports on each side. There are five roof hatches, three on the left and two on the right, on the top of the troop. NBC Reconnaissance Vehicle – The new vehicle is equipped with a wide range of sensors, a weather observation system, self-decontamination system and an air filtration system. The NBC reconnaissance vehicle carries the JGSDF’s chemical warfare response force. It replaces the chemical reconnaissance vehicles and the biological reconnaissance vehicles currently operated by the JGSDF. 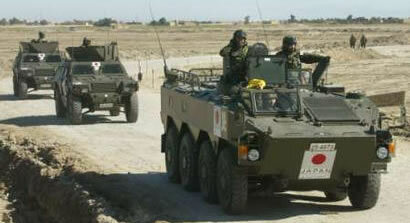 As part of the Japanese Self-Defense Forces humanitarian mission to Iraq, during the early part of 2004 the vehicle operated out of the Dutch military base near Samawa with Japanese troops.